The Vice-Chancellor, Professor Kolawole Salako speaking at the Convocation Press Conference. With him from left are Deputy Vice-Chancellor (Development), Professor Lateef Sanni, Deputy Vice-Chancellor (Academic), Professor (Mrs.) Morenike Dipeolu, Chairman, Nigerian Union of Journalists (NUJ), Ogun State Council, Comrade Wole Shokunbi and Head, Directorate of Public Relations, FUNAAB, Dr. (Mrs.) Linda Onwuka. The Vice Chancellor, Professor Kolawole Salako has reiterated that the importance of the Media to the progress and development of the University and nation building in general can not be overemphasized. Speaking during the University’s 26th Convocation Ceremony Press Conference, Professor Salako described the Media as partners in progress and an efficient platform and medium through which the activities, achievements and development in the University are communicated to stakeholders and the general public, stressing that the media briefing was yet another practical demonstration of the University’s commitment to town and gown relationship. The Professor of Soil Physics who noted that the Ceremony was historical and unique in the sense that, it was the first Convocation he would be hosting and presiding over in his official capacity as the Sixth Substantive Vice Chancellor of the University after clocking a year in office. He highlighted his modest achievements in the last one year to include restoring peace, stability and normalcy in FUNAAB. According to the Fellow, Soil Science Society of Nigeria, he came in to office at a time when the dust of the subtle crisis that rocked the University was settling down and felt the urgent need to calm frayed nerves and assuaged the aggrieved without compromising ethics and lowering standards. Speaking on his contributions to Infrastructural Development, Professor Salako disclosed that in the spirit of continuity, he has completed several inherited projects, adding that in the year under review his administration has completed 10 others while work is in progress on 14 projects. He expressed gratitude to the Federal Government and her agencies, notably the Tertiary Education Trust Fund(TETFund), for financing capital projects, the Needs Assessment Intervention Fund, and capital grants from the Federal Government through the Federal Ministry of Agriculture and Rural Development. On security, the Vice Chancellor stated that to guarantee the safety of lives and properties of members of staff, students and the neighbouring community, the University assisted to build a Police Post at Harmony Estate, which was commissioned in July 2018. He expressed appreciation to the State Police Command, Directorate of Security Service (DSS), the National Security and Civil Defence Corps(NSCDC), Vigilante groups and Community Development Associations (CDA) for their unflinching support and cooperation. Highlighting his activities on Innovation, Food Security and Finance, Professor Salako disclosed that during the year under review, he restructured staff establishment to Academic, Senior and Junior Establishment, conceptualization of Distinguished Lectures Series, Nimbe Adedipe Library Lecture Series and E-registration for fresh students. He added that through the Cassava: Adding Value for Africa (C:AVA), a Bill and Melinda Gates sponsored project, monumental impact and indelible mark in boosting food security has being made. According to him, through the project, the University has upgraded its Cassava Processing Factory towards producing high quality flour from cassava, yam and plantain as well as other root and tuber crops. 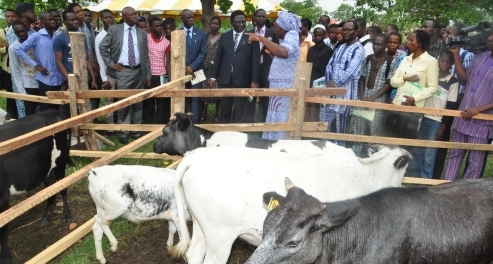 He said the University was in the process of upgrading its Bakery while it had obtained a certificate of registration from the National Centre for Genetic Resources and Biotechnology (NACGRAB) in respect of an improved indigenous breed of chicken called FUNAAB Alpha. Professor Salako further revealed that on finances within the year under review, the University has transformed the negative balance in its account in the Central Bank of Nigeria (CBN) to a positive balance, it had cleared the salary shortfall in 2017 and paid outstanding promotion arrears. With regards to Academic Development, the Vice Chancellor disclosed that presently, the University has 179 academic programmes comprising 44 undergraduate programmes and 135 graduate programmes while 82 percent of the University’s programmes are fully accredited by the National Universities Commission (NUC). He added that the University also enjoys improved access to learning resources while ensuring an effective and progressive Registry. The Vice-Chancellor, Professor Kolawole Salako addressing Journalists and members of the University Community at the Press Conference. The Vice Chancellor revealed that at the 26th Convocation Ceremony, the University will be graduating a total of 3,548 students with Bachelor’s degree from all its programmes, out of which 113 are to graduate with First Class Honours, 1,327 with Second Class Upper Division, 1,533 with Second Class Lower Division, 502 with Third Class and 30 with Pass Degree while the remaining 43 are the unclassified Veterinary Medicine Degree. He further stressed that the Postgraduate School would be presenting 79 Ph.D, 241 Masters(Academic), 65 Masters(Professional) and 33 PGD. Professors Wole Soyinka and Toyin Falola are to be bestowed with Honorary Degrees of the University. Earlier in his Welcome Address, the Chairman, Ceremonial Committee, Professor Biodun Badmus who was represented by the Head, Public Relations, Dr Linda Onwuka described the role of the Media as vital and essential to the success of every organization, urging them to continue to give their unflinching support and unalloyed cooperation to the University. In his Remarks, the Chairman, Nigeria Union of Journalists (NUJ) Ogun State Council, Comrade Wole Shokunbi lauded the Vice Chancellor for the achievements recorded within his first year in office, praying God for his continued success in the years ahead.